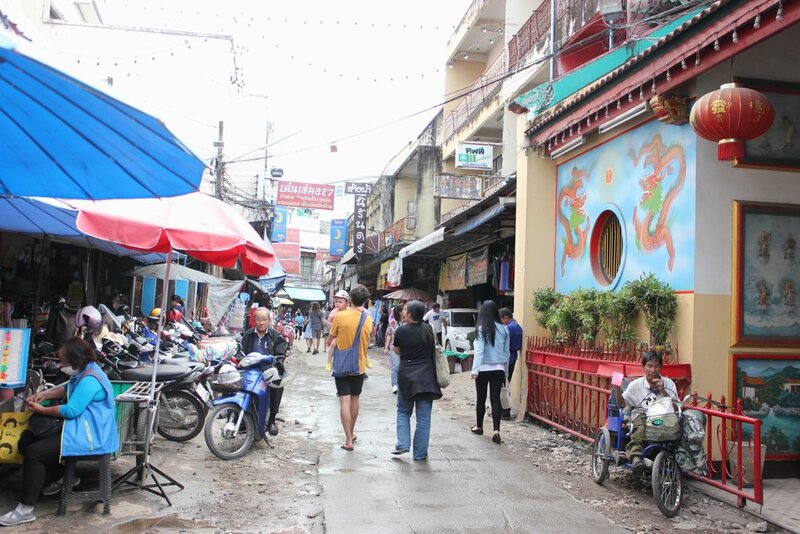 Duara co-founder Annika just returned from Thailand impressed by what she discovered there. “Opening the window and breathing cool mountain air or bathing in a local hot spring were unexpected experiences to find in Thailand, but perfect for Duara”, Annika says. Three new villages in Northern Thailand, near Chiang Mai, are now on our website, ready to host visitors! As Duara is all about linking economically less resourced communities with enthusiastic and adventurous travellers, the less touristic Northern Thailand proved to be a good match for Duara. Before finding the right villages and host families there is always lots of asking around, lots of research and lots of hassle. host families there is always a lot of asking around (how to find our local contacts-to- be), lots of research (where are the villages located, what kind of villages are they) and lots of hassle (how to get there, what to pack). After all that research we managed to find three potential villages which we could go and test. That’s when the real magic starts! This time we found the villages through South East Asian Women’s Network in Finland. Our match maker in Thailand is Aey. She has a long history of working with local communities and NGOs in Thailand. She also works as a freelance writer and lives in Chiang Mai. Aey suggested the chosen villages to us, and also found the local contact persons. After that there was the exciting part when we travelled to see the villages for the first time and to stay there for a few nights. This time Annika travelled with her 2-year old baby girl and husband. “I thank so much my daughter for being so zen and my husband for keeping one eye on our daughter and the other on the viewfinder of the camera while I was working”, Annika says. Annika and her family visited three villages. For nick names we could call the first village Tung Lakorn the Green Thai Village, the second village Pha Mon the Karen Hill Tribe Village and the third village Pong Nam Rong the Hot Spring Village. In Tung Lakorn the Green Thai Village, Annika and her family were escorted by Duang, a chef, who used to have his own restaurant and even a cooking show on Thai TV. Duang got enough of the buzz of cities and retrieved to live in Tung Lakorn. There he will guide families to host travellers and show travellers how to cook delicious Thai food. 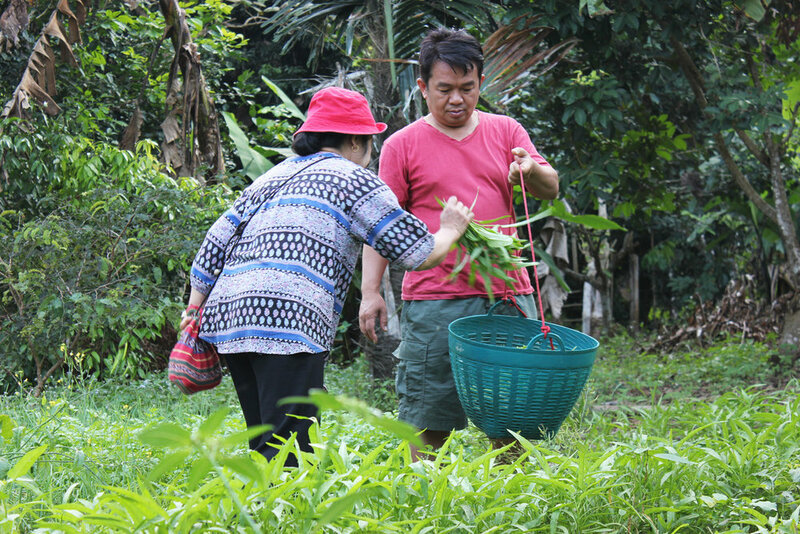 Most people here are farmers so you get to join picking ingredients for your meal from the garden. In the house where Annika stayed they even had a fishing pond and a crayfish pond so fish here is really locally produced! It is also possible to visit the local farmers’ market on Wednesdays. On rainy season you can learn how rice grows. And after work day in the fields locals gather in the food joints to enjoy barbecue together. The second village, Pha Mon the Karen Hill Tribe Village is close to the highest peak in Thailand, thus an ideal trekking destination. Our contact person Eh Paw is in fact a local trekking guide and can take you for a walk in the mountains. He also grows coffee as a hobby and can take you through the whole process: from a plant all the way to the hot cup of fresh filtered hill tribe coffee. In Pha Mon village people live from crafts weaving, agriculture and flower production. They are happy to take you with them to the fields or show you how to wove a traditional Karen vest. The houses are made of bamboo and they all have a cosy fireplace inside where to gather around and cook food. Our third find for a village stay is well suited for those looking for a more extreme nature experience. In Pong Nam Ron you can bathe in a hot spring or hike through the jungle to a hidden waterfall. Hardly any foreigners have been to the village before and locals take Karen cultural customs very seriously. During the annual festival Pong Nam Ron no one is allowed to drive motor vehicles or leave the village for 3 days. When Annika and her family were visiting, their contact person Aey had to stay outside the village area because had she entered, the next chance to leave would have been in two days. Those leaving during the festival must pay a fine according to village rules: 150 chickens or 10,000 Thai bath. But no worries, it’s only once a year. The village is a real opportunity to dive into Thai nature and Karen culture! All in all Annika and her family stayed in five families.It meant travelling on several motor bikes, learning how to make local handrafts and cooking plenty of Thai dishes. Frida, Annika’s daughter has broken the ice, so feel free to follow her steps! We guarantee: in all villages in Thailand food is superb, people are friendly and nature is beautiful. Photos by Annika from Duara and her husband Lauri. Annika is happy to answer your questions about the villages in Thailand.